BELLVILLE — On Friday evening, the Galion Tigers football team headed to the Colt Corral for a Mid-Ohio Athletic Conference clash against the undefeated Clear Fork Colts. It would prove to be a long night for both teams and when all was said and done, it would be the green and black coming out on top by a final score of 69-35. With the loss, the Tigers fall to 4-3 overall on the season and drop to 1-3 within the MOAC. As for Clear Fork, they keep their postseason hopes alive and improve to 7-0 overall and 4-0 in league play. 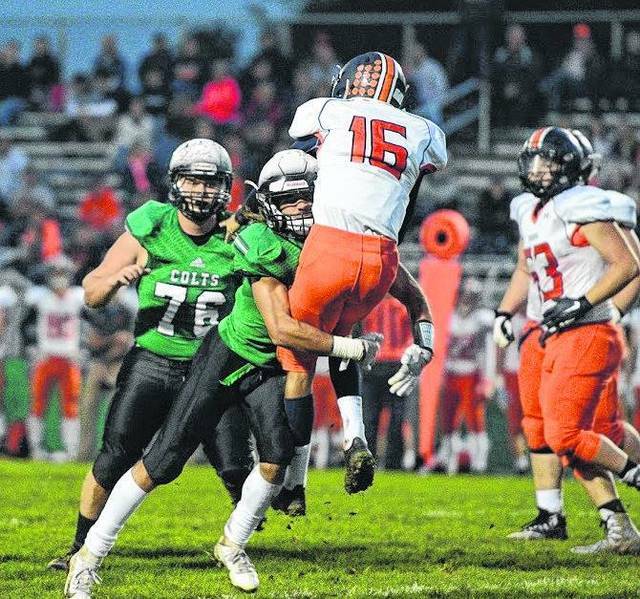 In week eight action, the Galion Tigers will host the North Union Wildcats for their homecoming game and Clear Fork will head to Ontario for a meeting with the Warriors. Galion would be the first to reach the scoreboard on the night as quarterback Elias Middleton ran the ball in from 10 yards out for the touchdown. Dominic Pittman would proceed to add the extra-point attempt and the Tigers were up early; 7-0. The opening score for the blue and orange was set up by a trick play that saw running back Trevor O’Brien completing a 39-yard pass to get Galion deep into Clear Fork territory. The Colts, however, would retaliate and less than a minute later were on the board thanks to a 14-yard rushing score by Jay Swainhart. Gabe Blauser converted his first of nine extra-point attempts on the night to knot the score at seven apiece. Clear Fork would take their first lead of the game with 4:23 left in the first as Brady Tedrow punched in an eight yard touchdown and with the PAT, it was 14-7, Colts. Clear Fork quarterback Jared Schaefer would connect with AJ Blubaugh a little over a minute later for a 17-yard touchdown to extend the home team’s lead to 21-7. After 21-unanswered points, the Tigers would see Middleton find wideout Isaiah Alsip for a 64-yard aerial strike and with another Pittman PAT, the Colts’ lead was cut to 21-14. It would, however, take the home team just 32 seconds to get on the board again as Trevon Trammell scurried in for a 26-yard rushing TD to put the score at 28-14. With the first quarter finally in the books, the Colts would need just 52 seconds to strike again as Trammell found the endzone on a five-yard run to extend the lead further; 35-14. Less than two minutes later, Middleton connected with Alsip again, this time from six yards out to inch closer at 35-21. In continuing with the trend of rapid-fire offense, Clear Fork needed just 16 seconds for Brennan South to find Caden Flynn for a 70 yard score and make the lead 21 points for the Colts. A good chunk of time went off of the play clock before Middleton and Alsip teamed up again for a receiving touchdown, this one from 60 yards. The Tigers would go for two but were unable to convert and with 4:18 remaining in the first half, the score was 42-27 in favor of the Colts. 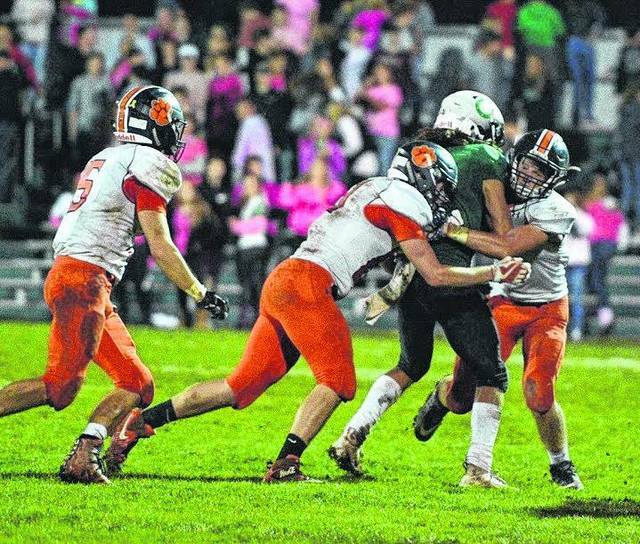 Both teams would prove that that was plenty of time to get on the board again as Clear Fork scored another touchdown via a three-yard run by Zach Homerick while Galion notched another TD on the defensive side of the ball on a Gavin Pennington “pick-six” from seven yards out. Middleton found Gage Lackey for the two-point conversion and when the clock reached zeroes at the end of the first half, it was Clear Fork up; 49-35. Scoring slowed down dramatically in the second half, with all of it coming from the Clear Fork Colts. Trammell rambled in from two yards out with a little of a minute gone in the third and was followed later in the frame by a 21-yard rushing score by Schaefer. In the fourth, Homerick scored again for Clear Fork to extend their lead to the eventual final score of 69-35. For the game, the Colts tallied 616 yards of total offense (228 passing, 388 rushing) to Galion’s 373 (274 passing, 99 rushing). Both teams were heavily penalized as the Tigers were flagged nine times for 60 yards and the Colts flagged 10 times resulting in 105 yards. Time of possession in the game was fairly even with Galion having the ball for 25:23 and Clear Fork the remaining 22:37. Both squads would commit two turnovers apiece as Clear Fork threw two interceptions and Galion had a fumble lost and an INT. The Colts racked up a total of 31-first downs on the night to Galion’s 17. Middleton wrapped the night with 250 passing yards on 12/27 attempts with three touchdowns and an interception. On the ground, the quarterback carried the ball 21 times for 51 yards and a score. O’Brien completed two of three passes for 24 net yards and also caught a pass for six yards. Alsip had a monster night for Galion as he was the recipient of eight passes leading to 197 yards and three touchdowns. Alsip also carried the ball three times for 39 yards. Kalib Griffin finished the game with three catches for 88 yards and had an interception on defense while Hanif Donaldson picked up 12 yards on three carries. Elsewhere in the MOAC on Friday, Buckeye Valley (3-4, 3-1) spoiled Pleasant’s (6-1, 3-1) undefeated season with an 18-6 upset. North Union (5-2, 2-2) had no issues with Harding (1-6, 0-4); 34-7 and River Valley (3-4, 2-2) edged Ontario (3-4, 1-3) by a final of 16-13.